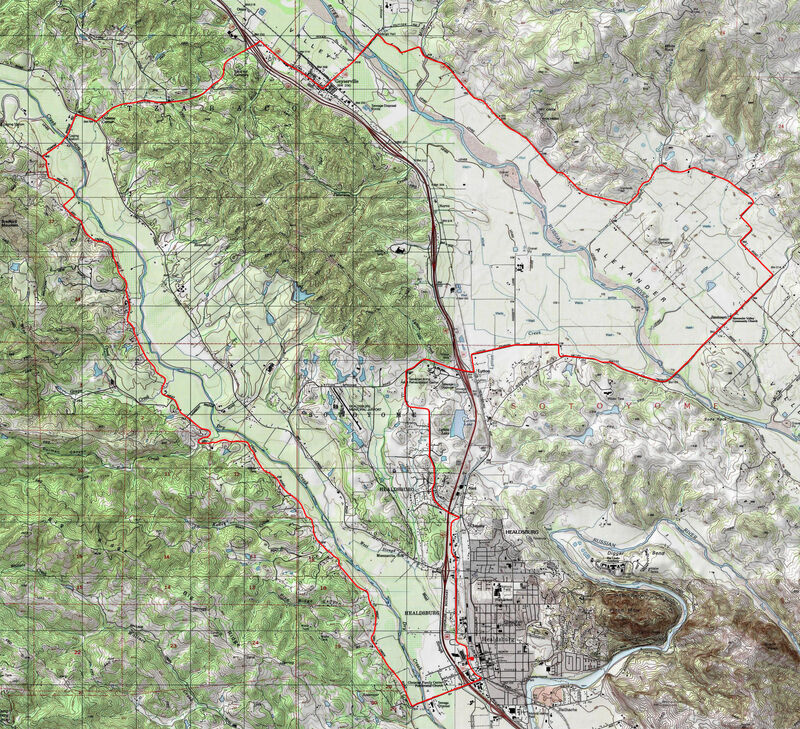 This is a route that essentially loops around the periphery of two flat-bottomed, wine-country valleys (Dry Creek and Alexander) in a medium-length and easy ride. If a friend were to ask me for a decent biking route through wineries, this one is likely to be my first recommendation for several reasons: the sights of vineyards are almost uninterrupted over the course of this ride; despite the respectable mileage, the ride involves very little physical challenge; and the location is considerably removed from the weekend crowds and traffic of central Napa or Sonoma Valley. I haven't come up with this route myself. I've taken the route, including its direction of travel as well as its starting point, directly from Bill Oetinger's great ride guide titled "75 Classic Rides, Northern California", whose route selection has never disappointed me. This is a book that I have recommended on other ride descriptions on this site before. If well-informed road-ride ideas are what you're after, you will find plenty in this book. This is a ride with no real climbing to speak of. The book that I took it from also describes it as an "iconic wine country ride route and possibly the easiest such one", and I would have to agree. The total amount of climbing, which is less than 1200 feet, is miniscule for the distance involved. While I've therefore marked the difficulty of this ride as a 4 out of 10, keep in mind that it's still a 30-mile ride. So, although there is no serious pedaling difficulty involved, the number of miles you'll have to cover is still 30. Riders who are after a truly easy ride should take that into account. On this ride, you can expect to see plenty of cute rustic sights such as pretty red barns as well as a number of picturesquely decrepit ones. Needless to say, you encounter numerous wineries along the way, some of which are open to tastings. You also get to see two pretty towns along the way that are very distinct from each other in character. Healdsburg is possibly the poster child of gentrification. These days, it's a posh wine-country town of gourmet food and high-end everything. Meanwhile, Geyserville, which admittedly is much smaller than Healdsburg, is a tiny town with a retained rustic character and a town center that consists of little more than two blocks on Geyserville Avenue. On the other hand, the ride doesn't really allow you much sense of wilderness. Throughout the route, the presence of scattered residences and plenty of vineyards constantly remind you that you're travelling through a heavily cultivated agricultural landscape. The starting point that I used for the ride is a parking lot near the city hall of Healdsburg, as suggested in Bill's book. This is a free lot with no time limits as far as I can tell, although it's a popular one. More importantly, during a certain part of the year, it becomes a farmer's market every Saturday. So, if you need to look for other spaces, street parking around this block appears to be free of time limits as well. Any further options will involve finding a space for street parking in the rest of central Healdsburg. The ride begins by immediately leaving Healdsburg behind and heading west on Westside Road, crossing first Highway 101 and then Dry Creek on the way. Westside Road feels like a major artery even though it may or may not have a lot of traffic; it's wide, straight, and well marked. Your time on this road is very brief, though. The sense of being on wine-country backroads really only hits you when you make it to Dry Creek Road. Dry Creek Road follows along the edge of the foothills bordering the Dry Creek Valley, frequently "stepping on the toes" of those foothills. So, although it doesn't really gain any net elevation worth mentioning, it's almost never flat. There are always gentle rollers, and a few of these can actually be seriously steep but none of those are longer than just a few dozen yards in length. Dry Creek Road establishes a pattern that is maintained over much of this route: a partially wooded hillside rising immediately from the roadside on your left while the road's right-hand side is flanked by a flat valley floor covered by a series of vineyards. I found that this formula results in very pleasant scenery. Dry Creek Road doesn't have a marked shoulder but it's wide enough to be safe regardless, in my opinion. Its pavement quality is quite good. In general, this first half of the ride is its prettier half, in my opinion, because this is the quieter portion of the loop in terms of traffic density and the views from Dry Creek Road across the vineyards on the valley floor are more frequently open. Once you cross Highway 101 near Geyserville, both of those stop being true, although the setting of most of Route 128 is fairly similar to Dry Creek Road, with a hillside on your left and vineyards occupying the flat valley floor immediately on your right. The loop takes you from Dry Creek Valley to Alexander Valley via Canyon Road. The stretch on Canyon Road corresponds to the tallest spike that you see on the ride's elevation profile plot. This might look ominous at first, but that's only until you pay attention to the vertical scale and notice that the whole thing amounts to little more than a hundred feet of net elevation gain. In other words, the entire ride is actually uncommonly flat and takes place almost entirely within a 200-foot range of elevation. Canyon Road is a wider road with heavier traffic than Dry Creek Road, and it introduces a marked paved shoulder space, but the quality of the pavement is pretty rough. It's not "damaged" but the asphalt is very coarse. The quality of the asphalt then improves once you turn onto one of the more minor roads in the second half of the loop. On Canyon Road, you also pass by a pretty little cemetery whose establishment is announced to be in 1900 by its wooden gate, which also appears to date from the same time. This is one of the cute nuggets that you encounter on this loop. Route 128 is possibly the busiest country road on this route. Although it's a wide road, for some reason, I didn't feel that it's super safe for cyclists. I think it might have been that too many drivers were passing by without leaving enough space for bikes, and perhaps too many cars were traveling fast as well. It's worth paying as much attention to the traffic in this segment of the loop as you do to the scenery. As you are crossing Alexander Valley for the second time in the eastern half of this loop, you go past the Jimtown Store. This is a bike-friendly spot that you'll often find mobbed by cyclists taking a rest stop. It's a cross between a deli/cafe and a gift shop, in addition to being a good spot to refill your water bottle from a hose. It would be a good idea to spare a few minutes to stop here on your ride, especially if it will be your first time. After Jimtown, Alexander Valley Road carries you across Russian River again and to the other side of valley. The bridge that you use on this last crossing of Russian River has a concrete surface that is inexplicably bumpy, by the way. It's not damaged, but for some reason it's very rough. The busy Alexander Valley Road would actually take you straight back into Healdsburg (after merging onto Healdsburg Avenue) if you were to keep following it all the way, but this ride actually takes to the less traveled side roads for a few more miles instead of doing that. By following Lytton Station Road, Lytton Springs Road, and Chiquita Road, the route takes you across Highway 101 one more time to approach Healdsburg in a more roundabout way. Other than avoiding busy traffic for a little while longer at the cost of riding on somewhat worse road surfaces, this detour doesn't offer anything I would consider a must-see. On the other hand, one straight stretch of Chiquita Road where you descend with a long segment of the road visibly rolling away in front of you is fun. One advantage of beginning the ride from Healdsburg is the fact that you'll also end it there, meaning that you'll have a wide variety of high-quality places to choose from if you'll be looking for a bite to eat. Although, if you expect it to be affordable, it might take some searching. One example of such a place that I can easily recommend if you don't mind the prices would be The Shed right near the suggested parking spot I point out on this page, and if not that, then the beginning point of the ride is just two blocks away from the town square at the center of Healdsburg where several of the best eateries in town are located.